I have always wondered why Lazio, my homeland, displays little interest in promoting its wines other than locally. It is true that the region has a pavilion at Vinitaly, and a fair number of wineries appear in the wine guides, but one need only browse the web to note that the wines of Lazio are among those least often mentioned and reviewed. Wine in Lazio is associated with Frascati, which is considered by many, despite the fact that much has changed over the years, a wine of little import. I'm not referring to those in the trade, who do however continue to dedicate less attention to Lazio than to other regions, but to the general public, who feel "There's only the wine of the Castelli Romani." The situation obviously is more complex; the region has made great strides, new areas have developed, there has been research and experimentation, many wineries, including new ones, work professionally and well, and the appellations have improved and grown. Good. Even though there is still neither the will nor the drive necessary to introduce the world to the many regional realities, from Viterbo to Frosinone -- and the recent establishment of Roma DOC does not help -- Mario Maccario, food & wine writer, sommelier, and wine and olive oil taster, has recently published a surprising book that provides a detailed picture of the wines of the Province of Latina and the Agro Pontino. I confess to having been skeptical when it arrived; I feared some sort of self-celebration in "guide" form of which we have a great many. Instead, it's an on-the-road narration of an important part of southern Lazio covering four well-defined appellations, Cori, Aprilia, Circeo and Terracina. A thorough study born of research Maccario began three years ago, published in installments on the online periodical Enopress, and presented in Rome during a conference at the Università degli Studi la Sapienza. The author, knowing the importance of shedding light on a situation that much can be said about, takes us on a journey into the history and culture of the various territories, discussing architecture and countryside while illustrating the foods and wines they produce. The book is in four chapters, each describing an appellation, its territory, the wineries, and other traditional foodstuffs present. I much enjoyed this organization into itineraries, which allows all to follow the paths to reach the wineries mentioned (24 in all). Maccario goes into detail for each winery, discussing history, philosophy, evolution, and also the wines produced, vineyard and cellar techniques, the varietals employed, and everything else necessary for a detailed picture of the estates. And more. At the end of the four chapters, in addition to providing beautiful photographs of the noteworthy attractions of the various regions, he presents images of the labels of all the wines produced by the wineries, something I find quite helpful for learning the names of wines and wineries. There is also a "Label Glossary," an impressive and very original resource that explains the etymologies of the wine names. 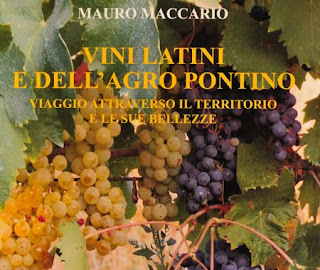 The final two sections of the book provide the addresses of the wineries, including emails and sites, and a list of wine shops in Rome specialized in regional wines. More than 200 pages that read quite easily, and show how much there is to discover even in a limited area such as the Province of Latina. Angela Galia has been working with wines in Sicily for many years, and in 2005 anagrammed the letters in her daughters' names to come up with Vero Vini. She makes a number of wines, all with labels drawn from Sicilian art, and all with dialectical names. Lumari means "as big as the sea." Brassy white with brassy reflections and a fresh bouquet with powerful floral accents, honeydew melon, and some savory notes. On the palate it's fresh, with honeydew melon fruit supported by loquat acidity that flows into a long savory loquat finish. Quite approachable. In addition to being a varietal name the word Grillo means cricket, and Ariddhru means both. Brassy yellow with brassy reflections. The bouquet is quite mineral, bringing to mind crumbled granite, with some floral accents as well. And some honey as it opens. On the palate it's full and rich, with unexpected loquat fruit supported by moderate sweetness and acidity, flowing into a clean finish with mineral accents that echo the nose. Enjoyable. Desire. This is a 50-50 blend of grapes form Pantelleria and -- I confess, I forgot to note the other source. A very intense floral bouquet with sweetness balanced by some citrus and greenish minerality. Deft, with beautiful complexity and harmony. On the palate it's full, with bright savory lemony fruit supported by clean mineral acidity and spice. Great depth and elegance, with a clean mineral finish that has some sweet notes as well. It will work quite well as an aperitif or with foods -- spaghetti with bottarga come to mind -- and I hated to pour it out. This is from the Latin Nigrum, black, a reference to the grape color. Deep black cherry ruby with cherry rim. The bouquet is fairly intense, with savory red berry fruit supported by clean bright berry fruit acidity and some jammy accents. Quite interesting, but very young. On the palate it's fresh, with bright fruit and quite deft, with rich berry fruit supported by tannins that are fairly bright and somewhat splintery, flowing into a clean plum-laced finish. A babe in swaddling clothes, still going in several directions, but quite promising. A bàgghiu is a walled in threshing ground, and this is a blend of Merlot and Syrah (chec) with no wood. Deep pigeon blood ruby; the nose has graphite shavings mingled with underbrush and mineral spice with some plum fruit; nice complexity. On the palate it's full, round and rich, with nice fruit supported by smooth sweet tannins that have some underbrush to them, and cedar that is from the Syrah, flowing into a warm spicy finish. Quite powerful and takes a bit of getting used to -- it's 15% alcohol but this won't prevent it from working well with grilled meats or hearty stews. A nice expression of the varietals and a nice reflection of the terroir, in a rather particular key that has a story to tell. Some fascintaing wines, well worth seeking out! What was once simply called Chianti is now called Chianti Classico to indicate it comes from (roughly) what is marked as Chianti on topographic maps. Everything else over a vast area that extends from the Colline Pisane to below Montalcino (far south of Siena), to Arezzo, and to north of Florence was simply called Chianti. However the area is too big to be manageable, and as a result a number of Chianti subzones have been established, to allow the winemakers of the respective areas to tie their best wines more closely to their land, while (if they want) labeling their base wines Chianti, which is now something of a catchall. As one might guess, Chianti Colli Senesi is the Sienese subzone of the Chianti appellation, though calling it a subzone is not quite correct. The Province of Siena, like most of Tuscany, is geologically complex, and has several broad swaths of territory that do quite well as grain fields but are not particularly suitable for vineyards. Therefore the Chianti Colli Senesi zone is actually three fairly large islands (for want of a better term) of viticulturally suitable land separated by the swaths of grain. I wrote the above to introduce a Chianti Colli Senesi presentation organized by Filippo Bartolotta , and shortly after the presentation was invited to a Consorzio tasting in Siena; the current vintage of the Vino Base and the Riserva, rigorously blind. I of course accepted, and enjoyed many of the younger Vini D'Annata, which are light quaffing wines of the kind one sets out at the beginning of the meal, drinks, and wants more of. To be honest, these are wines I think we need more of, because they go well with foods, supporting rather than distracting, and display a pleasing grace as well. There were also older wines, both vini d'annata and riserve, which were more of a mixed bag; while I liked some I found others to be trying too hard -- they obviously wanted to be Big Important Wines, but weren't quite making it. A few, instead, were graceful, echoing the vino base in a slightly richer key, and these I rather liked. Deep cherry ruby pale rim. The bouquet is vinpus, berry fruit with brambly notes and some iodine. Fresh brambly. On the palate it's light, with fresh cherry fruit supported by moderate acidity and tannins that have a slight greenish underlay and flow into a fairly dry tannic finish. Simple and direct, a quaffing wine that will go quickly. Deep purple cherry ruby with cherry rim. The bouquet is fresh, with pleasing floral notes, violets, some berry fruit and currants too with slight mentholated notes and hints jammy accents. On the palate it's light, with bright cherry black currant fruit supported by moderate currant (not red) acidity and tannins that flow into a clean fresh fruit driven finish. Pleasant in a fresh fruit driven key, and if you like the style you will enjoy it considerably. Black cherry ruby with black reflections and paler rim. The bouquet is fresh, with cherry fruit supported by a mix of violets and some greenish notes, and by some grape jam as well. On the palate it's fairly light, with bright berry fruit supported by slightly brambly acidity and tannins that flow into a clean brambly finish. Pleasant, and will drink well with foods, quite versatile with lesser grilled meats and similar, also pasta with meat sauce and similar dishes. Deep black cherry ruby, close to poured ink, with cherry rim. The bouquet is dusky, with plum prune fruit supported by some camphor and slight dried orange peel with a savory underpinning as well. On the palate it's moderately intense with moderate plum fruit supported more by minerality than acidity, and by tannins that are glancing and flow into a glancing tannic finish with some bitter accents. I'd have liked more zest than it displays, and also richer fruit. Impenetrable black almandine with almandine rim. The bouquet is moderately intense, with cherry plum fruit supported by some gum Arabic and moderate acidity. Still coming together, but gives an impression of being rather lunky. On the palate it's medium bodied with fairly intense peppery fruit supported by moderate acieity and tannins that have a warm peppery burr and flow into a peppery finish. It's angry, and I would have liked more richness and ripeness to the fruit. Deep black cherry ruby with black reflections and cherry rim paling to white. The bouquet is a bit rustic, with animal notes and some barnyard tang mingled with some red berry fruit and balsamic acidity. The palate reflects the nose, with sour balsam laced berry fruit with some savory notes and tannins that have a slight peppery burr. It's more aggressive and more rustic in style, and a wine that you will have to like the style to like. Deep black cherry ink with cherry rim. Quite charged. The bouquet is moderately intense, with some cherry fruit laced with hints of cumin seed spice and some stable straw too, as well as a slight airiness. On the palate it's fairly light, with moderately intense cherry fruit supported by minerality and slightly oxidative hazelnut shell aromas that flow into a fairly long hazelnut laced finish. Deep pyrope ink with purple rim. The bouquet is moderately intense -- gives impression of being behind -- with iodine and cherry plum fruit with some minerality as well. Pleasant and if it develops will be rather voluptuous. On the palate it's fairly rich, with cherry plum fruit supported by sour berry fruit acidity and by light tannins that have a slight brambly burr and flow into a clean rather bitter finish that's moderately long. Pleasantly fresh, and enjoyable. Deep black cherry with violet reflections and cherry rim. Quite dark. The bouquet is a bit more rustic, with balsamic accents and some stable straw mingled with greenish notes and some menthol, savory accents too. On the palate it's fairly light, and fairly sour, with sour cherry fruit supported by sour berry fruit acidity and tannins that have a greenish burr and flow into a greenish finish. It's more rustic than some, and a wine that you will like if you like the style (I rather do). If you prefer softer wines or wines with riper fruit it won't work for you. Deep black cherry ruby with black reflections and white rim. The bouquet is fresh, with slightly dusky cherry plum fruit that has some jammy notes, violets, and some savory accents. On the palate it's light, with bright cherry fruit supported by mineral cherry acidity and by tannins that have a mineral underpinning and flow into a clean rather bitter finish. Pleasant, and quite approachable, will drink quickly. Deep black cherry ruby with black reflections and cherry rim the bouquet is fairly intense, with violets and red berry fruit supported by some black currants and slight acidity, and by slight dusky bitterness as well. On the palate it's moderately intense, with fairly tart fruit supported by bitter minerality more than acidity, and by tannins that have a brambly underlay and flow into a rather bitter greenish finish. It's fairly direct, in a slightly more mineral key than some, with acidity and bramble more evident on the palate, and while this makes it less enjoyable far from the table it will help it work with foods, from pasta sauces through simple grilled meats, and also fried meats and vegetables. Deep black cherry ruby with almandine in the rim, which pales to white. The bouquet is fairly rich, with slightly balsamic sour berry fruit and cherry with some wild strawberry accents, some menthol, and some currant jam acidity. On the palate it's medium bodied, with bright sour cherry fruit supported by strawberry currant acidity and by tannins that are ample and slightly blocky as Sangiovese's tannins sometimes are, and it flows into a clean rather savory fruit laced finish. Pleasant, though more of a food wine than a wine to sip by the glass far from the table. Deep black almandine with black reflections and cherry rim. The bouquet is moderately intense with some warmth and some alcohol, and slight spice, but lacking in definition, and I found myself looking for but not finding much in the way of fruit. On the palate it's ample, with moderate rather bitter red berry fruit supported by moderate acidity and by tannins that are glancing and flow into a glancing finish with slight cedar. I'd have liked more depth and richness; this is not what I look for in a Riserva. Black almandine with black reflections and almandine rim. The bouquet is moderately intense and rather savory, with some berry fruit but not that much; it's in a holding pattern of sorts and not about to reveal much. On the palate it's more interesting in a direct way, with lively sour cherry fruit supported by berry fruit acidity and by tannins that have a dusky shadowy feel to them and flow into a clean rather savory finish with tannic underpinning. It will work well as a food wine though it's not for sipping far from the table. Fairly direct. Black cherry ruby with black reflections and pink rim. The bouquet is pungent, with wet leaves and some berry fruit supported by alcohol and slight greenish accents with some sea salt too. On the palate it's light, with lively sour cherry fruit supported by wild strawberry acidity and fairly light tannins that have a slight burr, and flow into a warm sour berry fruit finish. Pleasant and will be a versatile food wine. Pale black cherry with black reflections and cherry rim paling to white. The bouquet is fresh, with cherry fruit supported by minerality and some jammy accents, slight menthol, and slight strawberry acidity. On the palate it's fresh, with pleasant slightly greenish cherry fruit supported by brambly acidity and by tannins that are greenish and have a slight burr, flowing into a fairly dry tannic finish. Pleasant and versatile, but a food wine rather than something to sip far from the table. Almandine with black reflections and almandine rim. The bouquet is moderately intense with savory notes and some gum Arabic supporting warmth more than fruit. On the palate it's similar, with savoriness and warmth and tannins that have a vegetal burr, but fruit that is frankly more marginal than I might have expected. It will work well with foods, but in a Riserva I look for more fruit and depth. Impenetrable black cherry ruby with some almandine in the rim. The bouquet is moderately intense, with sour cherry fruit supported by slight greenish balsamic accents; it gives an impression of being held down. On the palate it's medium bodied, with sour cherry fruit supported by moderate acidity, and by tannins that have a dusky graphite burr and flow into a brooding fairly bitter finish. It's a bit dusky, and though it will drink well with foods I might have liked a little more verve. Deep black cherry ruby with some orange in the rim. The bouquet is eye opening, with a great gout of cedar at the outset, some mint, and some minerality. Not much fruit. On the palate it's medium bodied with moderate fruit and rather flat, there's not much acidity, while the tannins are sweet and smooth, and leave vanilla on the tongue. It's overshadowed by the wood, which doesn't have the strong feel of long barrique aging, but is very much there. Deep black cherry ruby with black reflections and cherry rim. The bouquet is fresh, with violets and berry fruit supported by some dusky notes and slight plum/grape jam. Fruit driven. On the palate it's pleasant in a ripe but not overripe key, with cherry plum fruit supported by savory acidity and some peppery accents, and smooth fairly round soft tannins that flow into a fairly long savory finish with slight peppery notes and plum fruit supported by mineral acidity that's more intense than I expected from the ripeness of the fruit; it keeps the wine from being overly soft --there are tannins and there is acidity and it will drink well with foods. Deep almandine with black reflections and almandine rim paling to white. The bouquet is fairly fresh, with warm berry fruit supported by acidity that has slight balsamic accents and some menthol, and some wet leafy underbrush as well. Pleasant and brings to mind dappled shade. On the palate it's bright, with lively sour cherry fruit supported by greenish mentholated accents and some green leather, also slight leaf tobacco, and by tannins that are warm and smooth and flow into a clean sour berry fruit finish that gains definition from nice acidity. Pleasant in a fairly traditional key revolving around acidity and its interaction with fruit and tannin, and also pleasantly mature; if you like the style you will enjoy it considerably. If you prefer softer or riper or younger wines it won't work as well for you, though you might find yourself changing your mind if you drink it with a steak. Deep black cherry ruby with black reflections and cherry rim paling to white. The bouquet is dusky, with some bitter notes and plum prune fruit supported by slight savory accents with some minerality. On the palate it's ample and rather bitter with moderate cherry fruit and tannins that have a warm savory burr, and flow into a rather bitter tannic finish. It's not as bright as I might have liked. Deep black cherry with slight almandine in the rim. The bouquet is fairly direct, and savory, with some berry fruit and some spicy warmth, and with more swishing underbrush and wet leaves. On the palate it's medium bodied, with moderately intense berry fruit supported by minerality and savory notes, and by tannins that are glancing and flow into a rather bitter tannic finish. It's a rather brooding wine that is in a "leave me alone" phase, but does show promise. I would give it a couple of years to come around. Deep black cherry with black reflections and almandine in the rim. The bouquet is moderately intense, with some sour berry fruit, but not much, some plum, and slight savory balsamic accents. It's hiding behind a screen, as it were. On the palate it's ample and rather soft, with moderate cherry plum fruit supported more by minerality than acidity and by dry brambly tannins that flow into a dry brambly finish. I'd have liked greater richness of fruit and more brightness; it has a settled feel to it. Deep black cherry ruby with black reflections and slight almandine in the rim. The bouquet is fairly bright, with cherry plum fruit supported by slight greenish balsamic acidity and some spice. On the palate it's bright, with fresh cherry fruit supported by sour berry fruit acidity and by tannins that have a slight peppery burr and flow into a clean peppery finish with underlying sour berry fruit . Pleasant, and will work well with foods. Deep black almandine with black reflections and almandine rim, it's close to poured ink. The bouquet is a rustic, with wet stable straw and some balsamic notes mingled with lathered horse and greenish leaf tobacco acidity. Not much fruit. On the palate it's again fairly rustic, with savory berry fruit supported by sour berry fruit acidity that has a slight animal tang to it, and flows into a rather bitter savory finish with tannic underpinning. If you like the style you will enjoy it, but you have to like the style. Deep almandine with black reflections and almandine rim. The bouquet is a bit more rustic than some, with greenish accents and some wet stable straw and a savory underpinning. On the palate it's medium bodied, with fairly rich sour cherry fruit supported by sour berry fruit acidity, a mix currant and strawberry, and by tannins that are moderately intense and rather splintery, flowing into a clean splintery finish. Deft, and a food wine of the sort one sets out and drinks, will work well with simple grilled meats and also fried meats and vegetables. Deep black almandine with black reflections and almandine rim. The bouquet is moderately intense, with savory notes and some balsamic warmth, and some gum Arabic with hints of prunes, but not much in the way of red fruit. On the palate it's quite direct, with sour cherry fruit supported by moderate mineral more than citric acidity, and by tannins that have a cedar laced rather bitter burr, and flow into a fairly long bitter finish. I would have expected more of a Riserva; it feels forced. Deep black cherry ruby with black reflections and cherry rim. The bouquet is a bit oxidized, giving pecorino cheese aromas and savory notes at first swish, and then leathery accents following. On the palate it's ample and dusky, with moderate cherry fruit supported by some acidity and by tannins that are blocky, and flow into a dry tannic finish. Deep black cherry ruby with black reflections and cherry rim. The bouquet is moderately intense, some acidity, slight sour berry fruit some greenish accents too. On the palate it's fresh and direct, with moderately intense fairly sour cherry fruit supported by berry fruit acidity and by tannins that are warm and brambly, with some savory notes as well; flows into fairly long savory finish. A very direct food wine that will support what it's served with without demanding center stage, and as such a wine of a kind I rather enjoy. Not for far from the table. Deep black almandine with black reflections and almandine rim. The bouquet is moderately intense, with warmth and some wood smoke, and slight sour berry fruit, but only slight, and I would have liked more Also some gum Arabic. On the palate it's ample with richer sour cherry fruit than I expected from the nose, supported by savory tannins that have a splintery burr, and by some savory minerality. It is better on the palate than the nose, but doesn't make that step up that one expects to find in a Riserva. Almandine with black reflections and some orange in the rim. The bouquet is moderately intense, with sour berry fruit and some spice, also greenish accents. On the palate it's more interesting, with bright sour cherry fruit supported by slightly brambly sour berry fruit acidity, and by tannins that are fairly smooth, though they do have slight greenish Sangiovese accents, and flow into a clean sour berry fruit finish. A pleasant food wine that will work well with pasta dishes, simple meats, and also has the zestiness necessary for fried foods; with time I expect the nose will gain ground, leading the wine to improve considerably. The score reflects the moment.. Pale almandine with black reflections and almandine rim; it's lighter and more garnet colored than most. The bouquet is warm and rather balsamic, with sour berry fruit and slight lathered horse supported by savory acidity and some greenish notes. On the palate it's medium bodied with bright sour cherry fruit supported by lively sour berry fruit acidity and by tannins that are warm, with a slight savory burr, and flow into a long warm berry fruit finish. Quit pleasant in a warm fairly light traditional key, and if you like the style it's one of those wines Italians say is da bere a secchiate, to drink by the bucket. Deep black almandine with black reflections and cherry rim. The bouquet is moderately intense, with some savory notes, slight wood smoke, and some cedar, but not much in the way of fruit -- concentrating reveals red berry fruit that's more generic than it should be. On the palate it's medium bodied, with bright sour cherry fruit supported by fairly bright acidity and by tannins that are warm and rather savory, flowing into a fairly bright sour berry fruit finish. The palate is more interesting than the nose thanks to acidity, and the wine will drink well with foods, though I would expect more depth from a Riserva. Deep black almandine with almandine rim paling to white. The bouquet is moderately intense, with lathered horse and some wet stable straw supported by balsamic notes and some savory acidity that bring bouillon to mind. On the palate it's medium bodied, with moderately intense sour cherry fruit supported by peppery spice -- almost petillance and by minerality more than acidity, flowing into a warm sour finish in which some acidity does emerge. I'd have liked a little more depth. Deep black almandine with almandine rim paling towards orange. the bouquet is dusky, with wet leaves and some underbrush mingled with savory notes and some red berry fruit, with slight plum as well, and hints of gum Arabic. On the palate it's medium bodied, with moderately intense rather dusky sour berry fruit supported by moderate berry fruit acidity and by tannins that have a slight cedary feel to them and flow into a fairly bright savory finish. Direct, a food wine that will work well with what it is served with, though it's not so well suited to being drunk far from the table. Expect it to go quickly. 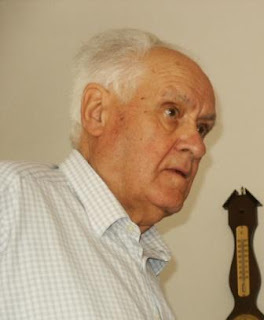 Garantito IGP: The Giulio Gambelli Prize for the Best Enologist "Under 35"
Every time I speak of Giulio Gambelli and his legacy, I cannot but divide the article into two parts, the first speaking as a correspondent, and the second as a friend. Today, February 16, at Flroence's Stazione Leopolda, on the occasion of the press conference for the upcoming Tuscan vintage presentations, we will present the first edition of the Giulio Gambelli prize, dedicated to "the young consulting winemaker who comes closest to Giulio Gambelli's winemaking philosophy." The prize will go to a winemaker, not more than 35 years of age, who during the calendar year (2012 for the first edition) has personally made wines following Giulio Gambelli's wine making philosophy: Maximum respect for the raw materials, and wines that clearly express both the varietals and the terroir from which they came. Why bring it up here? Because the prize is organized by the IGP, and by the newly established Association of Tuscan Enogastronomic Journalists, ASET. While ASET and IGP see to the organization, the three major consortia with which Giulio worked, the Consorzio Chianti Classico, Consorzio del Brunello di Montalcino, and Consorzio del Vino Nobile di Montepulciano, and the many wineries for who Giulio created unforgettable wines will provide support for the prize. I will not give you a list because it increases daily, and I'd hate to leave someone out. The prize will be awarded by two juries, which we are in the process of defining; for now we can say they will be made up of wine and food journalists. I will say more when the rules governing the prize, which will be awarded during the annual Tuscan vintage presentations, are drawn up. Good! Having finished with the news, a few words as a friend. Giulio Gambelli left us on January 3, leaving a hole so deep that the idea of establishing a prize blossomed on its own. Many thought that it imperative that his legacy be preserved. I'm not speaking just about wines, but also his correctness, humbleness, and knowledge of how to make the proper use of time. 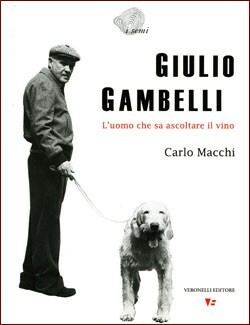 It is true that Mother Nature gave Giulio Gambelli an exceptional palate, but he would not have been able to make the wines he did had his character and approach to life been different. His genteel humbleness, his balance, his goodness, and his wisdom infused his wines with something that seemed very much like a soul. These days, as I have taken part in a few events celebrating him, I have had occasion to taste wines he made (vintage Chianti, nothing more) in the 60s, which still display freshness and depth. To say nothing of those wines from the 80s and 90s, famed throughout the world, and that justly astonished those I was with. Such astonishment in the eyes and expressions of those who didn't know him, such satisfaction, almost veneration for wines that really do have a father, and a story to tell. This story must continue, because certain values cannot but be a part of our society. In closing, allow me to dream, and imagine that today, during the press conference, Giulio will leave the divine wines he's overseeing for a moment, and look down at us. He won't say anything, because that's his nature, but he will be pleased. The Azienda Magnoni is a small estate in the Cilento region, about 120 kilometers south of Naples; the land had long been belonged to the Magnoni family, but Salvatore didn't decided to work with it until about 12 years ago, when they were faced with the choice of selling or making wine. The vineyard -- about 2 hectares; they also have olive groves -- is planted not far from the sea (though the opposing side of a valley hides it from view) at an elevation of about 300 meters, on prevalently clayey calcareous soils with a SSW exposure. It's mostly Aglianico, though there is a little Primitivo. This wine also contains about 15% Primitivo -- the Disciplinare allows it -- whose function is to make the wine more approachable. Deep pigeon blood ruby with violet rim. The bouquet is fairly rich, with red berry fruit supported by greenish accents, chalk, leaf tobacco, and spice, with some underlying plum from the Primitivo, and sunny acidity to provide balance. On the palate it's bright and fresh, with red fruit, a mix of berry fruit and plum, supported by warmth and some sandalwood spice that flows into a clean fresh berry fruit finish. Pleasant, and quite approachable though not lacking in complexity, with the Primitivo doing a nice job of smoothing and softening the Aglianico. They also drink it with shellfish, for example an impepata di cozze (mussels), and I can see why. The previous vintage; it's deep pigeon blood ruby with cherry rim, and has a fairly intense bouquet with berry fruit supported by greenish leathery accents -- the Primitivo is a little more evident here -- and has some jammier accents too. Hasn't completely come together yet. On the palate it's quite harmonious, with red berry fruit supported by some prune fruit and by tannins that are smooth and glancing, and also by slight plum sweetness, with it all flowing into a clean bright berry fruit finish. Pleasant but needs a few more months to come together. A classic example of a slower to mature vintage. Deep black cherry ruby with cherry rim. The bouquet is rich, with cherry fruit supported by some greenish vegetal accents; it's quite pleasant and also quite ripe, On the palate it's full, with rich cherry fruit supported by minerality and deft sandalwood laced tannins that flow into a clean fairly bright finish with tannic underpinning. I found it pleasant and quite approachable though a touch dry in the finish -- there is some new small wood -- though in the wines defense it is quite young, and also in a tasting situation. The same dryness will make it work well with succulent red meats, and it will reward those with the patience necessary to let it age for a year, or two, or more. A note: Salvatore's family also makes olive oil and runs a B&B that, to judge from the pictures on their site, would be a beautiful place for a getaway. The Photo used here is lifted from Luciano Pignataro's very nice profile. Podere 29 was established in 1942 under the ONC, or Opera Nazionale Combattenti program, which gave farmland to ex soldiers, much the way the Roman Republic once did. The original grant was 22 hectares in a single lot, and by the time the current owners took over in 2004 the property was in a state of total abandon. They have at present 4.5 hectares of Nero di Troia, planted in 2005, and this was their first vintage. Deep black cherry ruby with black reflections. The bouquet is fresh, with red berry fruit supported by spice and some peppery accents with slight graphite shavings and pleasant berry fruit acidity. On the palate it's quite pleasant, with bright sour berry fruit supported by lively cherry acidity and tannins that have a bright graphite burr and flow into a clean smooth berry fruit finish with lasting slightly bitter warmth. Quite pleasant, especially considering the youth of the vineyard; there's nice concentration and fruit, and while it does display Nero di Troia's trademark tannins they support without distracting. A fine wine for succulent red meats, and I have written in my notes, in capital letters, STEAK. 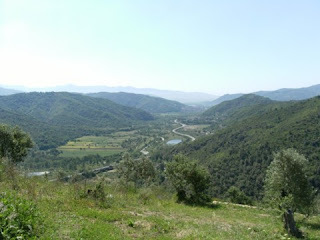 This fall they planted Fiano Minutolo, and I will be curious to taste it in a few years' time. The Image is lifted from their site. 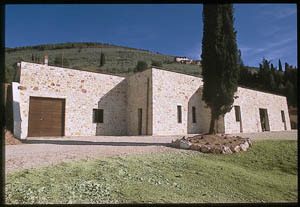 Carbone Vini is a small winery in the upper part of the Vulture appellation. They planted their vineyards in the 70s, but were forced to stop making wines in the 80s due to a series of difficulties suffered by the elder generation, and simply sold the grapes. A situation of this kind cannot continue indefinitely, and Sara and her brothers found themselves faced with the choice of selling everything or making the wines themselves when grape sales stopped being profitable. They chose the latter course, leaving jobs in different sectors to tend their vineyards and make wines. The vineyards are planted on volcanic soils, and since they knew the quality of the grapes they had been selling, they knew they would be able to make the wines they had in mind. Their first vintage was 2005. They had other varietals but replanted to Fiano in the late 80s; the vineyards also have a little Falanghina. Brassy white with brilliant brassy reflections. The bouquet is fairly bright, with vegetal notes and spice mingled with some herbal accents and a spicy underpinning. Not as rich as some Fiano, but this is a combination of vintage and likely terroir. On the palate it's consdìderably richer than one might have guessed given the nose, with lively lemony fruit supported by languid lemony acidity and slight greenish mineral accents, which flow into a clean lemony finish with mineral underpinning. The palate is graceful, and by now the nose will have caught up with it; I would expect it to age nicely for another 3-5 years. This is their base wine, which only sees steel, and the label also breaks with their others, because it's a day-to-day wine. Deep cherry ruby with cherry rim. The bouquet is bright, with berry fruit and some underbrush mingled with brambly acidity and some greenish spice. Nice in a zesty key. On the palate it's fresh, fairly rich, and direct, with cherry fruit supported by smooth tannins and warmth that flow into a clean fresh slightly greenish finish. Bright, up front, and quite on target; it will be a nice day-to-day wine whose only defect will be that it goes too quickly, requiring you to set out a second bottle. A soma is the load carried by a mule. 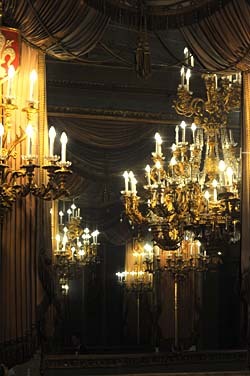 Carlo d'Angiò's wife owned the Castle of Melfi, and he liked the wines, so he ordered 400 some for the royal cellars. Lively black almandine with black reflections and almandine rim. The bouquet is fresh, with sour berry fruit laced with greenish accents and underbrush, and some sassy peppery accents. Quite fresh, with lively acidity that confers zest, and quite inviting. On the palate it's bright, with zesty sour cherry fruit supported by peppery spice and moderately intense acidity, while the tannins are peppery and flow into a long peppery finish. It's still quite young, and will profit considerably from another year or more in bottle. It will be worth waiting for. This is from their oldest vineyards, and is partially aged in new wood. Deep black almandine with black reflections. The bouquet is powerful, with vegetal notes and sour berry fruit supported by considerable underbrush, some sea salt, and some cedar with a warm spicy balsamic underpinning. On the palate it's full, bright, and very young, with sour berry fruit supported by zesty greenish acidity and by tannins that have a splintery greenish burr and flow into a fairly bright bitter tannic finish that's quite dry. It has considerable potential but isn't ready for polite society yet -- needs another 3-4 years to smooth, come together, and become a Different Person. Who will be worth waiting for. The photo is lifted from their site. This time Stefano, who has emerged from the snowy wastes, takes the stand. Lets begin by discarding the 2 Euro/liter dreck that we can find on the shelves in supermarkets, and say that if one works in the field (and Stefano does), finding excellent extravirgin oils is not difficult. Quite the contrary, Italy is full of them. Also, despite what mass communication would have us believe, quality is completely independent of geography, and this means it's simply untrue that the oils of some regions are great while those of others are bad. Quality is quality everywhere, and in the case of oil it derives from a frightening number of variables, none of which are secondary: climate, terrain, the surroundings, exposure, cultivation techniques, treatments, pruning, cultivars used, harvesting timing and technique, pressing timing and technique, and storage of the pressed oil. What is more difficult to find is an extravirgin oil that is of excellent quality, made in volumes that aren't Lilliputian, and reasonably priced, the latter being the primary force behind brand loyalty. Day before yesterday I had the good fortune to stumble across oil of just this kind in a trip to Florence, to a presentation of the oils made by the Gaudenzi family in Trevi. It's a family-run operation, which has, in its 60 years of experience, won many awards, and brought 4 oils pressed in the fall of 2011: Gaudenzi (the basic oil; 80% Moraiolo with Frantoio and Leccino); Quinta Luna (Frantoio, Moraiolo and Leccino, some of which is also bottled as DOP Umbria - Colli Assisi e Spoleto), Chiuse di Sant'Arcangelo (Moraiolo), and 6 Novembre (a "field blend," made by selecting the groves that produced the best olives each year). Let's begin by saying they're all excellent (my notes follow), and my personal preference is for Quinta Luna. But this isn't the most interesting thing -- strange to say -- about this press. It is instead the philosophy the family has chosen (successfully, it would seem) to follow: a closed cycle that includes field work, pressing, sales, and promotion, which has allowed them to present a series of extremely good oils, all sold directly at prices that are absolutely competitive: The 0.75 liter bottle of the Gaudenzi basic oil sells for 8 Euros and the Quinta Luna for 10, while the half-liter bottles of the Chiuse and 6 Novembre selections sell for 9. Dirt cheap for oils of this quality. Also considering that it's a large operation, by Italian standards: 23 hectares (about 60 acres) of proprietary olive groves all organically farmed, 25,000 olive trees, and more than 300 quintals of oil produced yearly, following a harvest that begins at the end of September and rarely extends past the end of November. "From an agronomic standpoint," says Francesco, son of Vittorio, who founded the company, "we took three major steps: first, an inventory of all of our trees to classify them by cultivar; second, planning the harvest on the basis of the cultivars, taking into account the different ripening periods of the various cultivars; third, the adoption of a double-cycle pruning system consisting of deep pruning every 5-6 years and yearly trimmings, which has allowed us to almost completely overcome the alternating full and lean harvests olive groves are known for, and thus produce consistent volumes from year to year." A team of 10 carefully selected people picks with the aid of agevolatori (not the tree shakers one occasionally sees in video clips); they pick by cultivar when the cultivars reach the optimal stage of ripeness, pressing the oils individually, and only later blend the oils from the different cultivars (this blending is called oleaggio, an oil blend, as opposed to the much more common, but less professional olivaggio, or blending of the different cultivars at pressing, which results in an oil from olives that are not all at the optimal stage of ripeness) to make the final oils. Gaudenzi Olio Extravergine Di Oliva: Nice, very well balanced nose, with evident but not overly aggressive fruit, fresh and almondy accents, hints of balsam. On the palate its entry is elegant, gradually developing pleasant bitter accents that present with harmony and delicacy, and slightest peppery spice. Very good. Quinta Luna: The nose is more powerful that the first, and ample and ethereal, almost penetrating, with greenish herbal accents, nice intensity of fruit, and excellent definition. On the palate balsamic accents are evident, while bitterness emerges strongly, balanced by sweetish notes. It's very long, with clearly evident artichoke stalks that also carry into an elegant finish. Superb. Chiuse di Sant'Arcangelo: The nose opens with delicate, but very clear tomato notes, in part green and in part dried; the fruit is full but delicate, giving way to freshly peeled almonds. On the palate it's intense from the outset, full, and fairly bitter, revealing strong flavors that fade into a more delicate peppery finish with delightful artichoke accents. Excellent. 6 Novembre: The nose is quite delicate, fresh, and just barely pungent, bringing to mind rosemary and evergreens. On the palate it's quite elegant, full bodied but not aggressive, with bittersweet artichokes predominating, and a very savory finish with bitterness that emerges at the very end. Excellent. Pairings? I'm against suggesting them. Try, and enjoy coming up with the best. Or let the producer advise you: they do this too. This year the folks at the Chianti Rufina Consorzio once again asked Ian D'Agata to present their wines, and he once again proved himself to be a fine speaker with an excellent understanding of the appellation. Chianti Rufina is a small area with a small number of wineries, and therefore is fairly uniform, much more so than the other Chianti areas, including Chianti Classico. With respect to the other Chianti zones it's the highest, with lively acidities, and, Ian says, a lighter textural feel in the mouth. I'm not sure that's universal, but taken as a group the Chianti Rufina wines do tend to revolve around finesse and elegance, with structures that are, yes, steely, but delicate rather than massive. The comparison with Burgundy they held last year was a great success, so this year they thought to pair Chianti Rufina with another Pinot Noir, and suggested a selection of wines from Oregon; while Ian agreed that they were good he felt and Oregon's wines to be nice but not equivalent, rather with more fruit and more alcohol than Rufina. In terms of an equivalent, he suggested Pinot Noir from Ontario. Ontario, towards the shore of Lake Ontario, is well suited to cool weather varietals such as Pinot Noir and Riesling, and Ian grew up tasting them; he said the first clones planted were so-so, and remembers the wines from the 70s as "hideous," but since then better clones have been planted and things have improved considerably. There are four appellations in Ontario: Niagara, Prince Edward County (where vines were first planted more than a century ago), Pelee Island, and Lake Eerie North Shore. The best, are Prince Edward County and Niagara, where they are now working to identify subappellations. How do Rufina and Pinot Nero compare? Not particularly well. Pinot Noir revolves primarily around finesse; it's an essential wine that would be too much were one to add a jot, and not enough were one to remove one. In other words, it's a balancing act, suspended high above the ground. Sangiovese and its allies in Rufina work in a different direction, displaying finesse, but also power, and playing off a balance between fruit, acidity and tannin that is very different from what Pinot does, but not necessarily inferior. If one were to borrow from the musical world, Burgundy grabs an instrument and plays a solo (for some reason the clarinet comes to mind), whereas Rufina gathers a group of instruments and plays a concerto. Very different expressions, but both can be sublime. We tasted Rufina wines from 2008, and Ontario wines from 2009. Two similar vintages, both cooler, and with more elegance than usual. 09 was a very good vintage for Ontario. Deep cherry with black reflections. The bouquet is rich, and spicy, with a fair amount of alcohol, cherry fruit, graphite shavings, bitterness, and dusky notes; there's nice depth, freshness and finesse. Young. On the palate it's medium bodied and graceful with lively sour cherry fruit supported by bright acidity and tannins that have a slight burr, flow into a clean fairly tart finish. Considerable finesse, which predominates over power, and elegance. Quite pleasant to drink and will also age nicely for 8-10 years at least. Something to seek out if you like the style, which is not lush, nor overly polished and smooth. Despite the presence of 8% Cabernet Sauvignon it has a more traditional feel, with brambles in the tannins. Deep black cherry with black reflections. The bouquet is dusky, with cherry fruit supported by some bitterness, spice, slight greenish acidity, hints of dried mushroom, underbrush and sea salt. On the palate it's medium bodied, and deft, with bright berry fruit supported by smooth slightly mineral acidity and polished smooth sweet tannins that flow into a clean sour cherry finish that's quite long, with some greenish vegetal accents. The Italian word that comes to mind is ruffiano, which means ingratiating -- it's very approachable, quite pleasant to drink, and if you are unfamiliar with Chianti Rufina and are coming from an international perspective provides a good introduction to it. Lively almandine rim with almandine rim. The bouquet is fresh, and brambly, with some berry fruit but more bramble, some heather, acidity that brings to mind a hot summer day, some spice, and as it opens hints of wood smoke. On the palate it's ample and fairly smooth, with bright cherry fruit supported by deft berry fruit acidity and smooth sweet tannins that flow into a clean fresh berry fruit finish. Pleasant, and nicely combines smoothness with finesse, more polished than the Le Coste and as a result slightly more approachable. Almandine with black reflections almandine rim. The bouquet is moderately intense and dusky, with graphite shaving bitterness, some spice, some alcohol, and minerality more than fruit. Elegant in cool weather key, and as it opens some iodine emerges. On the palate it's ample, and smooth, with fairly bright berry fruit supported by bitter graphite shaving minerality and some spice, and by a fair amount of alcohol and sea salt. Nice balance in a more mineral key, and suggests cooler temperatures. Indeed, we were told it is from a higher part of the appellation. I liked it, though some tasters found it more mature than they wanted it to be. Deep almandine with black reflections. The bouquet is intensely oaky, with cedary oaky sweetness mingled with spice and some berry fruit, though cedar overshadows all, allowing also some balsamic notes and some gum Arabic with underlying alcohol. On the palate it's ample and quite smooth, with moderate fruit overshadowed by cedar in the tannins, and supported by minerality and duskiness more than acidity, flowing into a long cedar laced finish with underlying bitterness oak colors all and directs the wine. Not my style. This vintage was difficult for them -- quite damp to begin with and the peronospora mold struck. Then temperatures jumped in Aug-September, and led to a degree of ripening that surprised them. Pale almandine ruby with black reflections almandine rim. The bouquet is deft, with berry fruit supported by sea salt and some savory notes, also by bramble and slight lathered horse and some balsamic notes. Pleasant in a rather distant, slightly rustic very traditional key,. On the palate it's deft, with bright berry fruit supported by some jammy accents I didn't expect, moderate acidity, and tannins that have a warm burr and flow into a clean rather bitter savory finish with some jammy notes from fruit. It's past the coming together phase but is very young, and is still tentative; with age it will be quite elegant in a lacy ethereal key, but it needs a few years to get there. Pale pinkish ruby with white rim. The bouquet is deft, with fairly rich berry fruit supported by minerality and sea salt with some underlying spice, and savory notes with hints of cumin. Quite graceful, though it does have a something about it -- not quite simplicity -- that suggests vine youth. On the palate it's bright, with lively cherry fruit supported by tannins that have a dusky burr and savory notes, and slight greenish accents, and flows into a bright tannic sour berry fruit finish Quite elegant and a very fine expression of pinot noir. Very young vines, planted in 2005 and this is the second vintage. Pale ruby, almost a dark rosé, and in this quite classic, with white rim. The bouquet is elegant, with cool savory berry fruit supported by dusky citric acidity and by brambly greenness with mint and balsam, some graphite shavings too. On the palate it's bright, with clean fresh sour cherry fruit supported by bitterness and sour brambly accents, and flow into a clean brambly finish Quite pleasant, and extremely elegant; it has a lot to say and will be much more interesting in a few years than it is now. Pale translucent brick ruby with pale rim. The bouquet is fairly intense, and rather wild, with bramble and sea salt supporting some fruit and citric acidity with strong underlying greenish accents and petroleum. Interesting, in a more demanding key, and more distant than the others. On the palate it's smoother than expected, with bitter petroleum laced berry fruit supported by tannins that have gunflint bitterness and flow into a bitter mineral finish with petroleum and fruit that lasts and lasts. We're not in Kansas any more, said Dorothy, and we're not in Rufina either. A world apart. This is a selection of the barrels, the remainder goes into Gravity. Translucent brick ruby that's slightly darker than the other Flat Rock wine. The bouquet is deft, and more mineral, with spice and greenish accents supporting spice and some greenish vegetal acidity. Nice depth and elegance, a touch more restrained than the base wine, as if it were gathering its strength. On the palate it's bright, with sour cherry fruit supported by considerable savory bitterness and spice, and by tannins that are smooth and have a rather bitter finish. It's more graceful than Gravity, and also has more spine, and with time may do more interesting things, but I found myself preferring Gravity's brash zestiness in some ways. It's a toss up, and which you will prefer depends upon your stylistic preference. Both are quite good, and it is very interesting to taste between them. The Reserve is more graceful, and displays more finesse. Pale translucent ruby with white rim. The bouquet is deft, with minerality and red berry fruit supported by savory notes and some bitterness; it's a bit less acidic (though still acidic) than the Niagara wines but displays considerable grace. On the palate it's bright, with lively sour berry fruit supported by deft berry fruit acidity, and by clean tannins that have a slight splintery burr, and flow into a clean fresh sour berry fruit finish. Very pleasant, showing considerable finesse, though you have to like high acidity wines to enjoy it. This is a blend of several Niagara and prince Edward fruit, made in the best years. A combination of the finesse of Prince Edward County and the richness of Niagara. Pale pink ruby with dusky black reflections and white rim. The bouquet is elegant, with savory berry fruit supported by some balsamic notes, dusky acidity, some menthol, and some savory acidity as well laced with hints of cumin and wet bark. On the palate it's bright, with lively sour cherry raspberry fruit supported by tannins that have a greenish burr and slight splinter, and by pleasant greenish acidity that flows into a clean bright savory finish with brambly bitterness. Enjoyable, with considerable finesse, and will drink quite well with foods. Versatile too. One thing to note about the Canadian wines is that they are all about 12% alcohol. The Italian wines tend to have more, and it would be nice to see them return to this level. Deep black almandine with black reflections and cherry rim. Looks younger than 8. The bouquet is elegant, with berry fruit supported by dusky underbrush and spice, some cherries, some alcohol, and slight sweetness as well. Quite a bit going on. On the palate it's full and bright, with lively cherry fruit supported by fairly bright acidity, and by tannins that have a dusky graphite shaving burr and flow into a clean fairly long bitter finish. Quite impressive, and graceful, with a great deal going on, though it is just entering maturity and has a long route ahead of it, is already very pleasant to drink. Extremely enjoyable. Pale brick ruby with black reflections and brownish almandine paling to white in the rim. The bouquet is interesting, with a rich of white truffle and spice with some cheesy accents that bring formaggio di fossa to mind, mingled with savory notes and some spice; with time graphite shaving minerality also emerges. On the palate it's full, with bright sour cherry fruit supported by red currant acidity and some spice, and by tannins that are quite smooth and flow into a clean rather bitter finish with some fossa notes. Pleasant, and after taking a sip the fruit becomes more apparent on the nose; it's graceful but a bit reserved, with less acidity than the younger wines and I don't think this is just greater age at work, but rather development of winemaking technique as well. Very nice however, and impressive, a wine one can converse with. The wines are in the order the vintage wines (2010) were poured in. Deep cherry ruby with white rim. The bouquet is rich, with fresh cherry fruit, brambles, dusky bitterness, graphite shavings, some violets, and black pepper spice; it's quite fresh with nice depth. On the palate it's bright, with fresh berry fruit supported by smooth sweet tannins that have some greenish accents and fairly rich brambly acidity that flows into a clean spicy bitter tannic finish. Freshness and finesse in a glass, and worth seeking out. Deep cherry ruby with black reflections. The bouquet is fairly intense and quote mineral, with spicy minerality supporting rather dusky cherry fruit that has slight sweetish jammy accents, and a degree of alcohol that also contributes sweetness. On the palate it's fairly rich, with bright strawberry laced berry fruit supported by warm sour berry fruit acidity and tannins that are smooth, and flow into a clean fresh sour berry fruit finish. Quite pleasant in a traditional key, and though it is still coming together, especially on the nose, it will go places, and display considerable finesse when it has arrived. Deep black cherry ruby with black reflections and cherry rim. The bouquet is dusky, with some bramble and moderate berry fruit mingled with some greenish accents, slight green leather spice, and with time the bramble gains in intensity. On the palate it's moderately intense, with moderate berry fruit that has some sweetish accents, perhaps related to alcohol, and flows into a fairly sweet bramble laced finish. It has an oddly dilute feel to it, and some of the fullness may be alcohol. I'd have liked more fruit. Deep black cherry with black reflections. The bouquet is moderately intense, with dusky graphite shaving bitterness and minerality more than fruit at present. On the palate it's light for a Riserva, with dusky moderately intense fairly savory berry fruit supported by tannins that have a warm splintery burr that flows into lasting savory warmth. I'd have liked more depth and verve. Deep cherry ruby with black reflections. The bouquet is quite fresh, with violets mingled with dusky bitterness, some cherry fruit, slight jammy accents, and some wet paint. On the palate it's medium bodied and rather splintery, with moderately intense cherry plum fruit supported by splintery tannins that flow into a fairly long warm splintery finish. It needs another year for the tannins to fold in, but is pleasant in a rather slender key, and made me think. I like that in a wine. Deep black cherry ruby with black reflections cherry rim. The bouquet is fairly rich, with jammy plum cherry fruit supported by some iodine and graphite shaving bitterness, also some wood smoke. On the palate it's ample with moderate fruit supported by minerality and some sour berry fruit acidity, flowing into a fairly quick finish that settles into splintery tannins. It's fairly direct, and gives an impression of trying hard but I found the fruit to be somewhat lacking; in its defense it is very young and still coming together; it may do interesting things with time because there is a certain finesse to it. We shall see. Deep black almandine with black reflections. The bouquet is fairly intense, with camphor and cherry fruit supported by some gunflint bitterness, some acidity, and minerality. Brooding, On the palate it's medium bodied, with moderately intense sour cherry fruit supported by splintery tannins that flow into a fairly quick finish. Direct, and up front. Black cherry ruby with black reflections and cherry rim. The bouquet is moderately intense, with spicy cherry fruit supported by minerality, some black pepper, a fair amount of alcohol, some spice, and greenish accents. On the palate it's moderately intense, with cherry fruit supported by strawberry acidity and tannins that are moderately intense, and flow into a clean slightly greenish strawberry finish. My initial impression was so-so, but it grew on me, and though it isn't long on complexity I found it enjoyable because of its freshness. Personal preference. Cherry ruby with white rim. The bouquet is fresh, with prune cherry fruit supported by some metallic brambly accents and some spice. Wet tree bark too. On the palate it's medium bodied, with dusky bitter cherry fruit with sour cherry-red currant acidity, while the tannins are light and rather glancing. Pleasant in a lighter key, and a nice fresh food wine of the sort one can set out with the certainty that it won't fight the food; its acidity is enough for fried foods, and you may want a second bottle. Deep cherry ruby with black rim. The bouquet is muted; swishing brings up some berry fruit and moderate spice, but it's clearly still coming together. On the palate it's pleasant, in a light key, with fairly bright berry fruit supported by greenish brambly acidity and splintery tannins that flow into a warm splintery tannic finish. Expect it to go quickly. A Food Wine. Deep black cherry with black reflections and cherry rim. The bouquet is dusky, with graphite shavings and iodine mingled with spice and a fair amount of alcohol, not much fruit. On the palate it's moderately intense with some cherry fruit supported by dusky sour cherry bitterness and a fair amount of alcohol, some sea salt, and tannins that are rather splintery. It's fairly direct, and I'd have liked a little more fruit to fill out the structure. Deep black cherry ruby with black reflections. The bouquet is dusky with graphite shaving bitterness mingled with some cherry fruit and peppery spice. Displays some distance. On the palate it's medium bodied, with moderately bright cherry fruit supported by dusky tannins that have graphite shaving bitterness and also by some brambly acidity, and flows into a dusky finish. Pleasant in a rather brooding mineral key. Deep black cherry with black reflections and cherry rim. The bouquet is dusky, with graphite shavings and some iodine supported by spice, sea salt and some berry fruit with a brambly underpinning. Scrappy. On the palate it's medium bodied tending towards light, with cherry and forest berry fruit supported by warmth and some dusky acidity, also tannins that are a touch blocky. I would have expected a little more; in its defense it is quite young and will with time become rather ethereal; it is more about finesse than power. Deep black cherry with black reflections and cherry rim. The bouquet is moderately intense, with greenish accents, lactic acid, some red berry fruit and some spice. On the palate it's moderately intense, with some red berry fruit supported by tannins that have a slightly milky feel to them and moderate mineral acidity. It's still up on the air, needs time to come together and develop. Deep black cherry ruby with black reflections and cherry rim. The bouquet is intense, and smoky, with quite a bit of sea salt, some balsamic warmth, and slight lathered horse; it's more rustic than I have found wines from this winery to be in the past. Not much fruit. On the palate it's fairly rich, with bright sour cherry fruit supported by sour berry fruit acidity that is also rather balsamic, and by tannins that are warm and splintery, and flow into a clean balsam laced splintery finish. It's frankly traditional, something I hadn't encountered in Basciano before, and if you like the style you will enjoy it. Deep black cherry ruby with black reflections cherry rim. The bouquet is moderately intense, with some berry fruit, some cherries, spice, and graphite shavings. On the palate it's medium bodied, with bright sour cherry fruit supported by moderately intense sour raspberry acidity with strawberry overtones, while the tannins are fairly light and smooth, with hints green leather, and flow into a fairly long slightly greenish sour berry fruit finish. Deep black cherry with black reflections paling in the rim. The bouquet is fairly intense, with jammy cherry fruit supported bys some cedar and spice, and moderate sweetness that's also alcohol, with some underlying greenish accents. On the palate it's brighter than I expected, with lively brambly berry fruit supported by brambly mineral acidity and tannins that are smooth and glancing, with some greenish brambly accents. Pleasant in a traditional key, and displays a degree of finesse that will likely increase with time. It grew upon me. Deep black almandine with black reflections cherry rim. The bouquet is moderately intense, with dusky berry fruit laced with graphite shaving bitterness, some spice, slight laundry soap, greenish notes, and hints sweetness. On the palate it's medium bodied, with moderate berry fruit supported by leathery accents and some underbrush; the acidity is warm and mineral, and there is some spice, while the tannins are dusky with some bitterness and some underbrush to them that brings wet bark to mind. Finish fairly long. Will develop ethereally. Pale cherry with some orange in the rim; it's surprisingly light for a Riserva.. The bouquet I unusual, with paint thinner -- for want of a better descriptor -- mingled with cherry fruit. Odd. The palate is warm with greenish berry fruit that is supported by moderate acidity and tannins that become surprisingly green with candied accents. A fellow taster mutters about grape juice, and whatever one says, it's not what I expect from a Chianti Rufina Riserva; the aromas and the fruit are going in different directions. Deep black cherry with black and white rim. The bouquet is moderately rich, with cherry fruit supported by spice and some minerality. On the palate it's fairly rich, with cherry fruit supported by some greenish acidity and bouquet tannins that are fairly strong with a bright youthful burr; it's very young but has nice balance in a solid muscular key and will also age nicely for a number of years. Deep black cherry with black reflections cherry rim. The bouquet is intense, with berry fruit supported by a fair amount of cedar, nice depth and expression in a slightly dusky international key. On the palate it's full and oakier oaky, with berry fruit supported by considerable cedar and some spice that flows into a chocolate and cocoa laced finish. It's the oakiest of the wines presented, but with respect to past vintages shows some restraint, enough that the fruit emerges, and if you like the style, it will do interesting things in a frankly modern key with time. Give the oak a year or two to fold in, however. Deep black cherry ruby with black reflections and cherry rim. The bouquet is fairly rich, with cherry fruit supported by spice and some greenish brambles, slight leaf tobacco and some minerality. Elegant in traditional key. On the palate it's ample, with bright strawberry laced cherry fruit supported by dusky bitterness and mineral acidity, while the tannins are smooth and fairly rich flowing into a clean fruit laced finish. Quite pleasant and will drink very well. Deep black cherry with black reflections cherry rim. The bouquet is elegant, with violets and red berry fruit that are surprisingly fresh for a Riserva, supported by spice and some delicate slightly mentholated acidity. Interesting and invites a second sniff. On the palate it's bright, with rich sour cherry fruit supported by deft berry fruit acidity and by tannins that have a warm burr and flow into a fairly long warm finish with berry fruit underpinning. Quite pleasant in a traditional key, and will with time display considerable finesse and elegance -- it has the latter down already, though it will increase, and is working on the former. Elegant deep slightly orange cherry with some almandine in rim. The bouquet is intense, with berry fruit supported by green leather and spice, and also by considerable bramble; it's quite elegant in an austere key. On the palate it's full and smooth with dusky sour cherry fruit supported by considerable bitterness and sour berry fruit acidity, and tannins that have a warm dusky burr with some cedar bitterness, and flow into considerable warmth. Very young but pleasant, and will do quite interesting things with time. Deep cherry ruby with black reflections. The bouquet is fairly rich, with mentholated cherry fruit supported by dusky spice and a fair amount of alcohol; it's quite young but elegant in a fruit driven key. On the palate it's bright, with rich cherry fruit supported by bright slightly splintery sour berry fruit acidity, and by tannins that are warm and splintery and flow into a clean bright berry fruit finish Quite pleasant, and though it needs another couple of years to come together, and will display considerable finesse when the various components have fully melded. Lively cherry ruby with black reflections and cherry rim tending overtones orange. The bouquet is moderately intense, with berry fruit mingled with greenish spice and some hints of paint thinner, and also a dusky cedary underpinning. On the palate it's ample, with warm sour cherry fruit that has some greenish acidity and is supported by tannins with a greenish cedary overlay, and flow into a fairly long clean rather green finish with lasting warmth. It needs a couple of years to come together, and it will be worth waiting for, in a rather ingratiating key when it arrives. The style is fairly international, though it does also have the acidity and tannic structure typical of Rufina. Deep black cherry ruby with black reflections and some almandine in the rim. The bouquet is moderately intense, with berry fruit supported by sea salt, sour berry fruit, and some rather cheeky warmth; it gives an impression of being in mid stride. On the palate it's fairly rich, with deft strawberry laced cherry fruit supported by smooth sweet tannins and a fair amount of warmth, while there is also alcohol that confers some sweetness, and flows into a long warm strawberry finish. It needs time, a couple of years at least, because it's still coming together now, and will be something to think about if you like the style, which is fairly traditional. Pale cherry ruby with black reflections and almandine rim. The bouquet is pleasant, with brambly berry fruit supported by spice and some cedar, and also by mentholated acidity; it's deft and rather graceful. On the palate it's fairly rich, with strawberry cherry fruit supported by mentholated acidity and tannins that have a warm splintery burr and flow into a clean bright slight greenish strawberry cherry finish. Bright, and pleasant, in an unassuming direct key. Cherry almandine with black reflections and some almandine. The bouquet is fairly intense, and dusky, with berry fruit supported by leather, some spice, alcohol and slight iodine; the effect is brooding. On the palate it's bright, with lively fresh strawberry laced berry fruit supported by moderately intense acidity and by tannins that are smooth, and flow into a clean strawberry laced finish with some underlying bitterness. Pleasant, in a fairly traditional key, and if you like the style you will enjoy it. Deep black cherry with black reflections and some almandine in the rim. The bouquet is elegant, with floral accents mingled with vanilla and supported by ripe berry fruit and some peppery spice; nice depth and elegance in a fairly modern key. On the palate it's bright, with lively cherry fruit supported by bright sour berry fruit acidity and slight sweetish jammy accents and slight greenish notes, while the tannins are warm and still quite young, with a blockiness that will fade with time as the wine ages and the tannins smooth. I'd give it 3-5 years and expect it to age well for at least 10 years, perhaps more.